An exhausted mother said she’s endured more than six months of living on a building site after workmen set up diggers, cranes and cement mixers metres from her home. Pulling back her bedroom curtains, she is faced with up to five workmen on her doorstep as they transform a disused factory into apartments. The 36-year-old says her fence was broken and her car damaged at the dust-covered site. 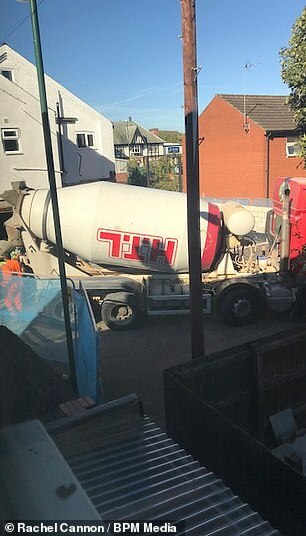 ‘I have had cement mixers outside, I have had to climb over my fence to get out of my house,’ she said. ‘It is so dangerous. She said that the company offered her compensation for the inconvenience but claims it has not materialised. 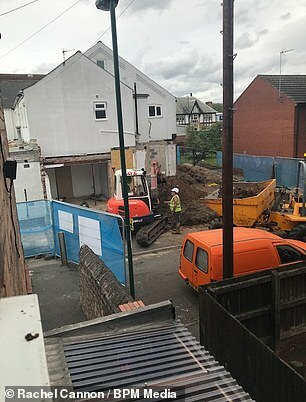 Land owners Hockley Developments said the work is being carried out by a contractor after planning permission was granted to convert a run-down building into 14 new apartments. The company based in Nottingham said the development has monthly checks from building control. Josh Woolley, customer service manager for the company, said: ‘Clearly when any site is developed there is potentially noise during the site hours of 8am to 4.30pm on Monday to Friday. ‘No works take place at the weekends or evenings. 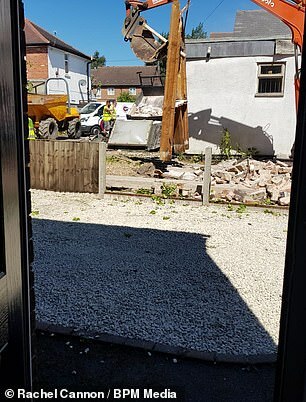 Whilst most of the neighbours near this particular development are very pleased with the transformation of this warehouse into new residential space, we are aware Miss Cannon has not been happy about the noise. 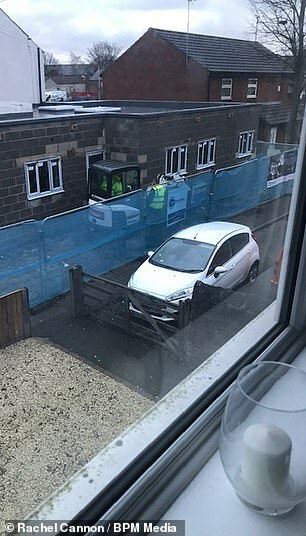 ‘We are aware that her car was damaged and the contractor paid for this to be fixed at her chosen garage and they apologised to her directly for the damage. ‘Both our contracts manager and myself have spoken to her at length as well over the last few months, and as a company we offered her £500 as a goodwill gesture towards the inconvenience caused by the conversion. ‘We will speak to Miss Cannon again, and we are sorry to hear that she is still unhappy. This development is only four months from completion and all further works are now internal, so noise should be minimised at the development.